Elaine Black Yoneda was born Elaine Rose Buchman in September 1906 to Russian Jewish immigrant who had escaped their lives as factory laborers in Czarist Russia. Both her parents had been active in the Jewish Workers Alliance and encouraged Elaine to join the Young Workers League when they moved to Los Angeles in 1924. Elaine joined the International Labor Defense, a legal defense organization, after seeing an elderly woman assaulted by an anti-communist Red Squad. Mentored by fellow ILD member Ida Rothstein, Elaine soon became a regular feature of the ILD, bailing out strikers who had been arrested, participating in demonstrations and political organizing, and eventually serving as a district secretary. 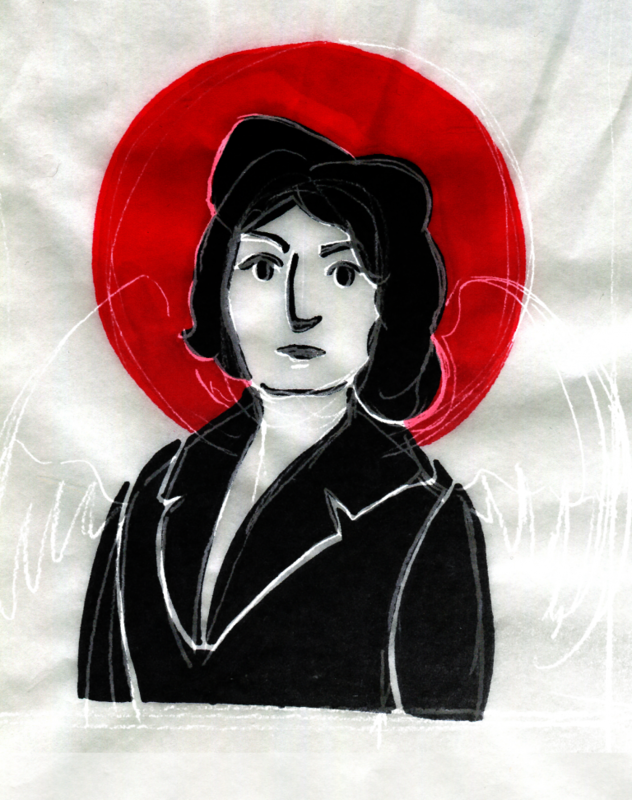 She became known as the “Red Angel” by the police, when she came to pay bail for communists and leftists who were being held in police custody for labor demonstrations. It was while paying his bail that she met Karl Yoneda. Karl was born in America, but educated in Japan, from where his parents had emigrated. He developed progressive ideals while in school, and was inspired by Karl Marx’s writings such that he changed his name to “Karl.” Elaine divorced her first husband to be with Karl, but as residents of San Francisco, California, Karl and Elaine couldn’t be married due to anti-miscegenation laws. They traveled to Seattle, Washington in 1935 for a legal marriage before returning to San Francisco to continue their activism work. Elaine worked on the San Francisco 1934 general strike, the only woman on the steering committee, which managed the 83-day strike starting from the longshoremen on the waterfront. Her efforts supported agricultural workers, and demanded release of Tom Mooney and those arrested for criminal syndicalism. She ran unsuccessfully for the San Francisco Board of Directors, using her maiden name, Black. When Executive Order 9066 was issued in February 1942, removing all West Coast Japanese residents and all Americans of Japanese descent to internment camps, Karl and their young son Tommy were sent to Manzanar internment camp. Elaine opted to go with them and lived for eight months behind barbed wire until Karl volunteered with the U.S. Army, and she and Tommy were allowed to go home. Elaine remained a social activist for the rest of her life, chairing a chapter of the Civil Rights Congress, and fighting for reparations for the Japanese-Americans who were imprisoned during World War II. She remained active in peace and civil rights activism, and was a member of The International Longshore and Warehouse Union’s Women’s Auxiliary. The day before her death, she attended a longshoremen’s rally for presidential candidate Rev. Jesse Jackson. She died of a heart attack on May 29, 1988.